In terms of views and images, “Jupiter Ascending” is a spectacle with an impressive space footage, sometimes rousing action sequences and titillating extraterrestrial fantasies. But just as a book of Jack Vance, it really doesn’t make any sense in the beginning. The difference is that while reading that book of Vance, the intended message becomes clear to you. 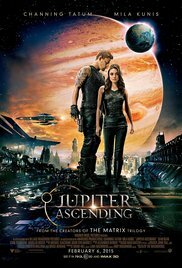 With “Jupiter Ascending” it’s still fairly muddled and incomprehensible in the end and you seem to sink into hotchpotch of futuristic ideas. An epic work that throws together different aspects from other SF classics such as “Flash Gordon“, “Star Wars” and “Battlestar Galactica“. The added Cinderella fairytale with someone living on earth whose DNA equals that of some space queen, makes it complete. Jupiter Jones (Mila Kunis) is of Russian descent and has to get up early every day to help her mother clean up rich people houses. Every day she plunges the toilet brush in dirty toilets, without realizing that she has identical genes as the deceased matriarch of the house of Abrasax and in that way she’s the owner of planet Earth. The house of Abrasax is an alien royal family that owns several planets. These planets serve merely to be harvested so they can produce a youth serum. The remaining heirs Balem (Eddie Redmayne) Kalique (Tuppence Middleton) and Titus (Douglas Booth) only benefit from the disappearance of this earthling. And that’s when Caine Wise (Channing Tatum) shows up. Caine, a former soldier, has been instructed to protect Jupiter. The Wachowskis not only experienced a physical (at least one of the two) transformation, but there’s also something missing when it comes to creativity because they seem to be unable to match the masterful and groundbreaking “The Matrix“. Visually “Jupiter Ascending” is a masterpiece, but the story is a messy and chaotic whole. The release of the movie was delayed because of certain deficiencies and they still needed to adjust the visual character of the film. That wasn’t a good omen in the first place. Especially the characters without depth, the ridiculous dialogues and a forced romantic story make this film pretty weak. I admit that the rescue operation at the beginning of the film in which Caine prevents Jupiter being abducted by alien “Keepers”, while flying around on his jet-like roller skates, was a breathtaking part that lasted for ages. The flashy chase between the buildings is intense, exciting and masterfully portrayed. But that wasn’t the last time he had to save her. The film seems like an endless rescue operation. And after a while those special skates aren’t that special anymore. The weakest point of this movie are the characters. Mila Kunis is better than expected but unfortunately it feels as if she’s running around the whole movie screaming out loud, while showcasing her “looks”. Channing has a tough appearance, but soon gets bogged down in an uninspired parody of himself, struggling with his own feelings. The duo eventually ends up as a kind of “Danny and Sandy in space” couple. A faint love story about two people from two different space systems. The Abrasax family is also a mishmash that didn’t really convince. Tuppence Middleton plays no significant role at all. And Redmayne surprised me completely (after I’ve seen him shine in “The theory of everything“) as the wily and cruel Balem who sounded fairly menacing with that whispering voice. Until he starts shouting out of anger and frustrations in a fit. I spontaneously started to chuckle. The only two actors who were convincing were Sean Bean and Douglas Booth. And let’s not forget the Russian family sitting together at the dining table. These scenes achieved the highest grade of humorous content. Do you want to be lead away through the infinite universe where you’ll experience one surprise after another and become completely bewildered by the brilliant computer graphics (and as I have been told the 3D version is unprecedented) ? Well, then you have to see this epic space story, full of strange creatures, aliens and exotic places. You also like some romantic posturing and a happy ending ? Than you shouldn’t miss it either. But are you also wishing for a fascinating story filled with interesting characters, then this will be a huge disappointment. A better alternative is “Guardians of the Galaxy” where the mix of all these ingredients doesn’t create a bitter aftertaste ! Great special effects. Story was so so.